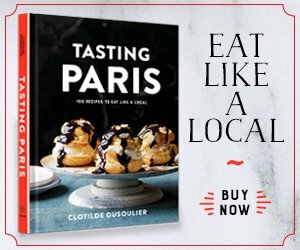 This book is a window onto my Paris, this delicious stomping ground for the food enthusiast. It is the companion I wish I had for every city I visit, pointing me to the edible highlights and giving me the lowdown on the dining scene, the best food shopping haunts, and the locals’ favorites. 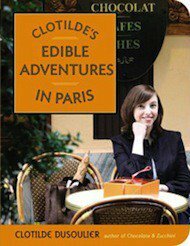 “In Clotilde’s Edible Adventures in Paris, Clotilde reveals her all-time favorite food experiences in her native city. She takes us on a mouthwatering tour of the restaurants, wine bars, and outdoor markets she loves the most, as well as cheese, pastry, ice cream, candy, chocolate, and cookware shops. It is the companion I wish I had for every city I visit. She covers everything from the best places for lunch, tea, or a glass of wine to “neo bistros” and the newest places to go for spectacular yet affordable meals. 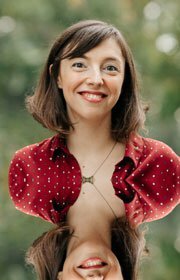 Packed with advice on everything from deciphering a French menu to ordering coffee correctly, this book is like having Clotilde as a personal guide. Twelve tempting recipes are also included, shared or inspired by Clotilde’s favorite chefs and bakers. Visit THE BOOK’S MINI-SITE for excerpts, reviews, and more. [May 2011] Et les vegies s'il vous plaît. 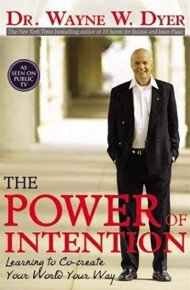 [July 2009] Best Culinary Travel Guide in the World. [August 2008] Try these food-savvy companions for Paris. [July 2008] Enjoy Paris eateries without the flight. [May 2008] Guide Dishes Up Mouthwatering Adventures in Paris. [May 2008] In Paris, Mastering the Art of Le Fooding. [April 2008] Is it a cake or is it a tart? Maybe it’s both.